Supporters of civil legal assistance to low-income Americans have adopted resolutions and issued statements calling for bipartisan action to ensure LSC and the 136 LSC-funded programs can continue to fulfill the nation’s promise of equal access to justice. Like many other federal programs, LSC has been operating on an interim funding bill, known as a Continuing Resolution, for Fiscal Year 2011 that maintains LSC at its Fiscal Year 2010 budget levels. The Continuing Resolution, originally set to expire March 4, has been extended by Congress to March 18. On February 19, as part of the Continuing Resolution, the House of Representatives passed a $70 million cut in LSC basic field funding from current levels, reducing the funds to LSC grantees by about 18 percent. The impact of the proposed reduction would be devastating. An estimated 160,000 fewer low-income Americans would receive civil legal assistance and an estimated 80,000 fewer cases would be handled by LSC grantees. Read LSC's press release on the House action. Stephen N. Zack, President of the American Bar Association, said the proposed House funding cuts “would hurt people in every region, from Kansas to Kentucky, Texas to Virginia, Ohio to Florida.” He added in his February 20 statement, “We must find a way in this recession to protect funds that help struggling families handle crises involving their homes, bills, health and well-being. Legal aid providers, backed by the Legal Services Corporation, do this important work. The American Bar Association will fight to ensure they can continue it.” Read Zack’s statement on the House cuts. The ABA House of Delegates approved a resolution on Feb. 14 opposing any proposal to cut funding for LSC in the current fiscal year. Stephen P. Younger, president of the New York State Bar Association, which initiated the resolution, said, "We are in an access to justice crisis in this country. The fiscal crisis has turned our courts into hospital emergency rooms leaving millions of Americans litigating without benefit of counsel….We are so pleased that the ABA has passed this critical resolution and call on Congress to restore sufficient funding to meet demonstrated legal needs." Read the ABA resolution opposing LSC funding cuts. Several state bar associations and access to justice commissions have written to members of Congress to support current funding levels for LSC. They include the Boston Bar Association, Colorado Hispanic Bar Association, State Bar of Georgia, Hawaii State Bar Association, Maine State Bar Association, State Bar of Michigan, Minnesota State Bar Association, Nevada Access to Justice Commission, State Bar of Nevada, Rhode Island Bar Association, Tennessee Bar Association and others. Nine members of the Corporate Advisory Committee for the National Legal Aid and Defender Association, in a March 1 letter to congressional committees, opposed the proposed cut in LSC funding. The letter from generals counsel at America’s largest corporations called LSC “one of the most successful public-private partnerships” and urged continued support for LSC’s mission. On March 4, the Senate Appropriations Committee released a proposal to fund the federal government through the remainder of Fiscal 2011, under which LSC would continue to operate at current funding levels. The proposal does include spending cuts, but none would impact LSC. After the House and Senate resolve Fiscal 2011 funding issues, the Congress will move to the Fiscal 2012 budget requests from the LSC Board and the White House. The Board last year adopted a resolution seeking $516.5 million for Fiscal 2012, the same funding level requested by the Board for Fiscal 2011. The White House has recommended $450 million in LSC funding for Fiscal 2012, a $30 million increase over current funding. Read LSC’s press release. A free electronic tax filing system, launched with funding from the Legal Services Corporation eight years ago, has grown to include 560 partners in 49 states helping low-income workers apply for the Earned Income Tax Credit (EITC). This year, with about six weeks to go before the April 18 deadline for filing tax returns, the free system, called I-CAN! E-File, has processed more than $110 million in EITC refunds and tax credits. The e-file project and a new website to assist military veterans are among the ways that LSC-funded initiatives provide access and information that help low-income Americans. “We are in record territory at this point in the tax year,” said Robert J. Cohen, executive director of the Legal Aid Society of Orange County, a nonprofit program funded by LSC that created the electronic filing system. “This e-file system is an innovative and successful project that makes a positive difference in the lives of low-income workers and their families,” he said. 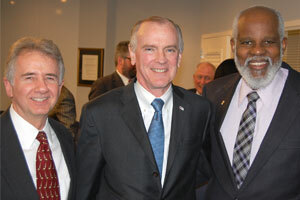 LSC President James J. Sandman (center) stands with Warren Oliveri (left) and Wilhelm Joseph, president and executive director, respectively, of Maryland’s Legal Aid Bureau. The Atlanta Legal Aid Society and the Georgia Legal Services Program welcomed new LSC President James J. Sandman on February 10. Sandman met with Atlanta Legal Aid Executive Director Steve Gottlieb and George Legal Services Executive Director Phyllis Holmen. During his visit to Atlanta Legal Aid, Jim Sandman and Steve Gottlieb discussed the challenges that the LSC president faces in a time of fiscal pressures. The two discussed how Atlanta Legal Aid had prepared itself for the economic downturn and also how it continued to provide high-quality services to Atlanta’s low-income community and to maintain its various special projects for particularly vulnerable populations like homeowners subject to foreclosure, people with AIDS and cancer, seniors and the disabled. At Georgia Legal Services, Jim Sandman met with Executive Director Phyllis Holmen and State Bar Pro Bono Director Michael Monahan and, among other topics, discussed the scarcity of private attorneys in rural Georgia who can do pro bono work. Mike Monahan pointed out that 40 percent of Georgia's 159 counties have 10 or fewer active lawyers, and that count includes judges, prosecutors, and other categories of lawyers generally unable to provide civil legal services. The meetings with the Georgia programs were held during the ABA’s recent mid-year meeting in Atlanta. Jim Sandman participated in and spoke at meetings of the National Association of IOLTA Programs, the ABA Commission on IOLTA, and the ABA Standing Committee on Legal Aid and Indigent Defense (SCLAID). On February 17, Jim Sandman visited the Baltimore office of Maryland Legal Aid, meeting with the Legal Aid staff, members of the judiciary, the private bar and another major funder. He told the group that his priorities are to increase LSC’s funding, expand public awareness of civil legal assistance and to strengthen alliances with other groups that serve low-income communities. Wilhelm Joseph, the Maryland program’s executive director, hosted the meeting. Among those attending were Maryland District Court Chief Judge Ben Clyburn, Retired Court of Appeals Judge Irma Raker, Equal Justice Council cochairmen Andrew Jay Graham and Ben Rosenberg, Maryland Legal Services Corporation Executive Director Susan Erlichman, Legal Aid Bureau President Warren Oliveri and former LSC Board member Herbert S. Garten. Herbert S. Garten (left) accepts the 2011 Fellows Award from James P. Nolan, president of the National Conference of Bar Presidents. Herbert S. Garten, a former LSC Board member, was honored with the 2011 Fellows Award from the National Conference of Bar Presidents. The award was presented during a luncheon at the recent American Bar Association meeting in Atlanta. The award recognizes the accomplishments of a past bar president who has demonstrated a continuing commitment to leadership, service, the work of the organized bar and the purposes of the National Conference of Bar Presidents. Mr. Garten is a past president of the Maryland State Bar Association and a founder of the Maryland Pro Bono Resource Center. He is the president of the Baltimore law firm Fedder and Garten, P.A. 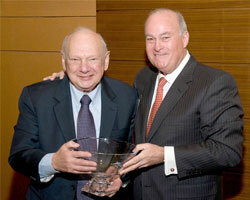 Throughout his legal career of nearly 60 years, Mr. Garten has been a champion of legal services. From 1994 until 2003, Mr. Garten chaired the Maryland Legal Services Corporation. In 2003, he was appointed to the LSC Board of Directors, serving for seven years. He is currently a member of the Maryland Access to Justice Commission, the Southern Conference of Bar Presidents, the Federal Bar Association and the American Judicature Society. The Department of Housing and Urban Development announced March 1 that it had awarded $40.8 million in grants to fair-housing organizations and non-profits to fight housing and lending discrimination, including about $7 million to LSC-funded legal aid programs. The grants were awarded through HUD’s Fair Housing Initiatives Program and will support efforts to investigate housing discrimination and enforce fair housing laws, educate the public and housing providers about fair housing laws and serve rural and immigrant populations in underserved areas. Sixteen LSC-funded programs in 10 states received a total of 21 grants—14 for investigation and enforcement efforts, four for serving underserved populations and three for education. The LSC programs receiving grants are in California, Florida, Hawaii, Idaho, Illinois, Maine, Michigan, New York, Pennsylvania and Tennessee. For more information, read HUD’s press release announcing the grants. Low-income New Yorkers facing foreclosure might soon have access to free legal help, according to a plan outlined by Jonathan Lippman, the state’s top judge, in his 2011 State of the Judiciary Address ( 443k) on Feb. 15. Under Judge Lippman’s plan, homeowners who could not afford a lawyer would be paired with a pro bono or legal aid attorney—free of charge—during their foreclosure settlement conference, a court-ordered meeting of lender and homeowner that occurs in all foreclosure cases in New York. Nearly two-thirds of homeowners have no legal representation at these conferences, according to Judge Lippman. The plan is scheduled for statewide implementation by year’s end, but will begin as a pilot project in Orange County and the New York City borough of Queens. Legal Services of the Hudson Valley, an LSC grantee, has been picked by Lippman to represent homeowners in Orange County. The Legal Aid Society of New York City will provide representation in Queens. For more information, read “New York Courts Vow Legal Aid in Housing,” in The New York Times. Leaders from the Texas access to justice community held a press conference at the state Capitol on Feb. 16 to highlight the state’s continuing legal aid funding crisis and to announce a comprehensive legislative solution to the problem. As in many states, legal aid programs in Texas have suffered steep cuts in funding from Interest on Lawyers’ Trust Accounts and other sources, all while struggling to meet an ever-increasing demand for their services from Americans impacted by the recession. In recognition of the problem, the Texas legislature appropriated $20 million for the state’s legal aid programs in its last session and is being urged to maintain that funding. Other legislative solutions proposed by the access to justice community include increasing certain court filing fees to benefit legal aid, creating a dedicated fund for legal aid and other purposes, and charging creditors a fee on the transfer of property following a foreclosure sale. A 2-year-old boy had all the symptoms of severe eczema when his mother brought him to Jose Alberto Betances, MD. Before seeing the pediatrician at Boston Medical Center, the single mother of four had taken her son to another facility, where higher doses of medication did not appear to resolve his condition. After a few questions, Dr. Betances discovered that more than allergies were ailing the child. The family had been battling their landlord over a roach infestation in their public housing apartment. The boy was known to be allergic to the bugs, which lurked in the floors, refrigerator and sinks. That's when Dr. Betances picked up the phone and called a specialist. Only this time, it was not another doctor. It was a lawyer. "Sometimes, medically you can only do so much," Dr. Betances said. "You realize that, as specialized as your training has been, you still can't help the health of this family. But it's not because medicine is failing." Through that call, Dr. Betances was connected with Edward Rice, a housing expert and a staff attorney at the Volunteer Lawyers Project of the Boston Bar Assn., which provides free legal assistance to low-income residents primarily through pro bono services of private lawyers. Rice began building a case to convince housing authorities that the roach problem was harming the boy's health and to compel the landlord to act. "As a lawyer, I can argue there is [a connection], but I can't prove it without the doctor," Rice said. "So we hit the problem from both sides." Note: The Volunteer Lawyers Project is the LSC grantee that serves the Boston area. A Claysville woman was sentenced Tuesday in federal court to 22 months in prison for embezzling more than $188,000 from Southwestern Pennsylvania Legal Services Corp.
Cheri A. Logue, 42, of 1118 E. Finley Drive, was sentenced by U.S. District Judge Terrence F. McVerry on a charge of theft from a program receiving federal funds. She embezzled the money while employed at SPLS as a bookkeeper/secretary between October 2001 and June 2008. SPLS is a government-funded agency that provides free legal services to low-income people. The U.S. attorney's office determined that she wrote 86 checks to herself for more than $90,000 but recorded them in the books of SPLS as payments to legitimate creditors and suppliers, and made 56 unauthorized withdrawals using the SPLS debit card totaling more than $12,000, typically at or near gambling locations. Logue also processed 25 unauthorized electronic fund transfers for more than $14,000 to pay her own bills and made more than 300 improper charges to the SPLS Visa card for more than $72,000. Continue reading this story or read the press release from the U.S. Attorney’s Office of the Western District of Pennsylvania. Legal aid is about helping ordinary people with real-life problems. Client stories illustrate the day-to-day struggles—and victories—of poor Americans seeking justice under law. When we first met Hillary Lamb, the worry and embarrassment were visible on her face. "I was embarrassed cause people are going to look at it like she's working and she couldn't even pay her bills, but they’re not knowing the background of the situation," Hillary said. Hillary, who works full time as a shift manager at Wendy's, got behind in paying her maintenance fees to her homeowners association. "What had been a minor mistake snowballed into a major catastrophe," attorney Greg Nodler said. Last December Hillary got all caught up on her maintenance fees but the late payments led to $921 in legal fees she couldn't pay. Then her HOA foreclosed on her home, a home she owned outright. "The more you’re coming out the more you’re sinking," Hillary said. By law Hillary had 180 days to reclaim her home but she needed $4,000 - money she didn't have. That's when FOX 26 viewers stepped in. Nodler, an attorney with Lone Star Legal Aid, set up a fund for viewers who wanted to help. "We were getting calls from Georgia, we got a check for Hillary from a cancer survivor in Missouri that had been here receiving cancer treatment," Nodler said. "I'm so happy, I'm so happy to get my house back," Hillary said. If you donated or just remembered her in your prayers, Hillary couldn't be more grateful. “I thank God for people that he placed in my path like even you," Hillary said. "Thank you all, God bless you all." Created by Congress in 1974, LSC’s mission is to promote equal access to justice in our Nation and to provide high quality civil legal assistance to low-income persons. LSC Updates is produced by LSC’s Office of Government Relations & Public Affairs. Questions, comments, or articles can be submitted to Steve Barr, Media Relations Director, at barrs@lsc.gov.